"A dark premise for a story, yet told with startling wit and excitement. The incredibly humorous dialogue means you’ll chuckle until your pancreas ruptures. The characters are genius, all of us can relate to a character or two from Spritz. Pages literally jump out and I found myself visualising the scenes, completely immersed in my new surroundings." "Spritz, the impressive debut novel from Neil J Hart... the real key is Hart’s ability to hit all the right emotional notes, making the reader care about a fairly unattractive cast of characters... through the timeless themes of hope, despair and sometimes even love." "This is the funniest book I have read in a long while. 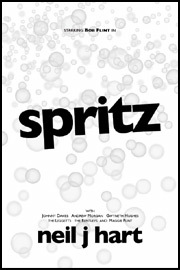 Spritz offers a cocktail of pathos and humour that keeps you guessing to the end." "A product clearly of the whole spectrum of popular culture... Spritz is sure to appeal to anyone who enjoys outlandish, quintessentially British humour, and also extraordinary events populated by recognisable everyday characters." Fragile is an independent publishing company that promotes new talented writers. As well as publishing books for online ordering we also offer a variety of pre-publication services to writers to help their work stand a chance in the highly competitive literary industry. Have a look through our site and get in contact should you have any questions about Fragile Publishing. Spritz is a black comedy crime thriller set against the backdrop of rainy Swansea that follows the life and times of professional alcoholic Bob Flint. The novel parodies famous film and tv archetypes, scenes and dialogue which transports the reader from the humdrum existence of it's central characters. © Copyright Fragile Publishing 2009. All rights reserved.